Thinking of getting into mountain biking but don’t know how to start? Fabian Kim, owner of Kinetik Cycles in Coquitlam, has some helpful tips on how to get rolling. 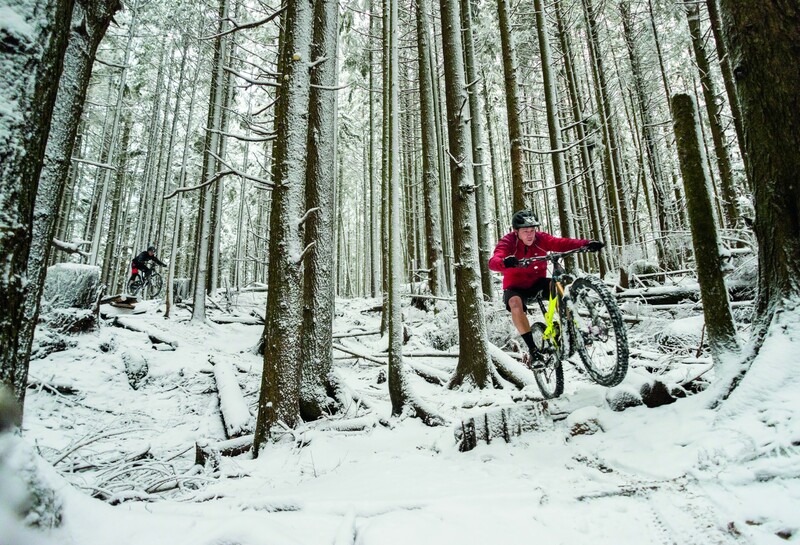 Located on the edge of nature, Coquitlam is an up-and-coming mountain biking destination. Burke Mountain and Eagle Mountain are right on our doorstep, home to the West Coast style of riding that the North Shore and Squamish are famous for — a maze of big trees, roots, rocks, flowy singletrack and well-built features, most of which are built and maintained by the volunteers of the Tri-Cities Off Road Cycling Association (TORCA). First of all, Kim says, decide on what kind of bike you need, depending on the types of trails you’ll be riding. If you’re riding on easy, hard-packed trails, you can get away with a basic mountain bike. But once you hit the mountain trails — with their steeper grades and obstacles — you’ll need full suspension (front and back). “It’s more fun. You get better traction and impact,” says Kim, explaining that the tires with full suspension are closer to the ground, so it’s safer and less bouncy. And hey, as Kim points out, the trails are free. His final advice for riders? “Try to have fun. That’s what it’s all about. Mountain bikes keep on changing — new standard size, new geometry — and sometimes people get caught up with this, but as long as you have fun on two wheels, that’s all that matters.” Gee Louter, who also works at Kinetik, agrees. “Don’t get caught up on the gear and which bikes to ride. Just get out there and try it,” he says. Are your kids eager to ride? 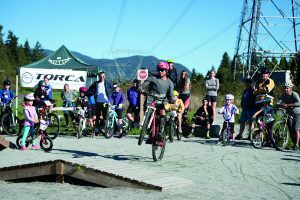 TORCA holds an awesome free event each September at Mundy Park Skills Park called Take a Kid Mountain Biking. Leaders teach the kids new skills and then take them on a guided ride. For more information on TORCA or the free event, visit TORCA. If the idea of heading out onto the trails on your own sounds intimidating, why not join a group? The Tri-Cities Off Road Cycling Association (TORCA) leads guided rides twice monthly to trails throughout the area. Sign up as a member for $20/year. Go car-free and discover the freedom of being on two wheels! 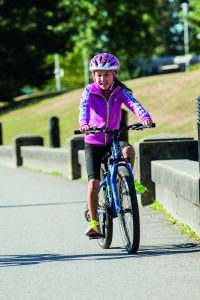 Coquitlam has been steadily investing in new bike routes and riders have plenty of options. Riders can take advantage of on-street bike routes, as well as off-street paths, including those along Pinetree Way and Johnson St.
Take your bike on the SkyTrain and explore the city by road. For bike route information and maps, visit coquitlam.ca/cycling and translink.ca/en/rider-guide. There are also plenty of trails — some paved, others gravel — near the SkyTrain stations: coquitlam.ca/trails. Hard to pick just one day or moment because I have too much fun every time I go out mountain biking, especially with a great group of people. If mountain biking, definitely Burke Mountain. Burke Mountain has tons of trails for beginners to advanced riders. If looking for a casual recreational ride, the Coquitlam River trail or Mundy Park is great.